The problem with seeing is that you only see what you see. We may see something and try to make reasonable deductions from it. We assume that what we see is all there is. All too often, the assumption is completely erroneous. We wind up making decisions based on partial evidence. Our conclusions are wrong and, very often, consistently biased. We make the same mistake in the same way consistently over time. Steve is very shy and withdrawn, invariably helpful but with little interest in people or in the world of reality. A meek and tidy soul, he has a need for order and structure, and a passion for detail. Kahneman then asks if it’s more likely that Steve is a farmer or a librarian? If you read only what’s presented to you, you’ll most likely guess wrong. Kahneman wrote the description to fit our stereotype of a male librarian. But male farmers outnumber male librarians by a ratio of about 20:1. Statistically, it’s much more likely that Steve is a farmer. If you knew the base rate, you would guess Steve is a farmer. We saw a similar example with World War II bombers. Allied bombers returned to base bearing any number of bullet holes. To determine where to place protective armor, analysts mapped out the bullet holes. The key question: which sections of the bomber were most likely to be struck? Those are probably good places to put the armor. But the analysts only saw planes that survived. They didn’t see the planes that didn’t make it home. If they made their decision based only on the planes they saw, they would place the armor in spots where non-lethal hits occurred. Fortunately, they realized that certain spots were under-represented in their bullet hole inventory – spots around the engines. Bombers that were hit in the engines often didn’t make it home and, thus, weren’t available to see. By understanding what they didn’t see, analysts made the right choices. I like both of these examples but they’re somewhat abstract and removed from our day-to-day experience. So, how about a quick test of our abilities? 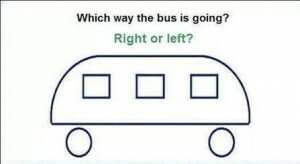 In the illustration above, which way is the bus going? Study the image for a while. I’ll post the answer soon.